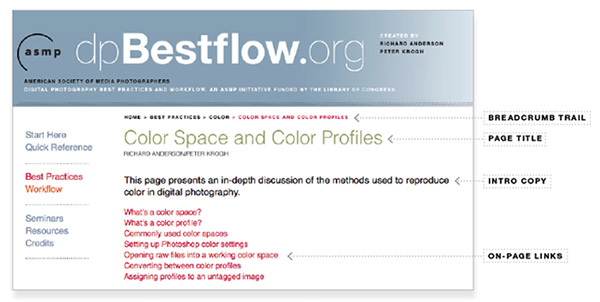 Welcome to the dpBestflow® website, your resource for nearly anything you want to know about digital photography. A quick look through the menus will make it apparent that there's a Master's Degree worth of information in the site. How the heck is anybody supposed to navigate this? Well, we have an answer for you. This page presents strategies for finding the information that's right for you. The best way to show you what's here is, well, to show you. Watch the movie to see how the site is structured, and how we expect that you can approach it. Figure 1 We've made a movie that shows you the elements of the website and how you can navigate the material. Many readers may arrive here after first seeing the printed version of the Quick Reference. You can find a link to that document at the left, and you can use it as a kind of table of contents. Use it to guide your research about storage hardware, or image editing applications, or how color works, to name a few options. At the end of each recommendation in the Quick Reference, there's an icon that brings up relevant links. Use these to find out how to put the recommendation into practice. Figure 2 Each item in the Quick Reference is followed by a link that takes to you a place in the website where that recommendation is explained. In many ways, the workflow pages are the easiest way into the material. Each workflow page starts with movies that show you how to perform the described task. Below that, you'll see a set of the steps, and some charts and diagrams that outline the tasks involved. While these pages give a good description of how to perform a set of steps, they don't spend much time explaining the background of the processes. If you are looking for the "why", you'll want to follow the page links to the Best Practices section, where you'll find a discussion of the technology and our recommendations for how to use it. 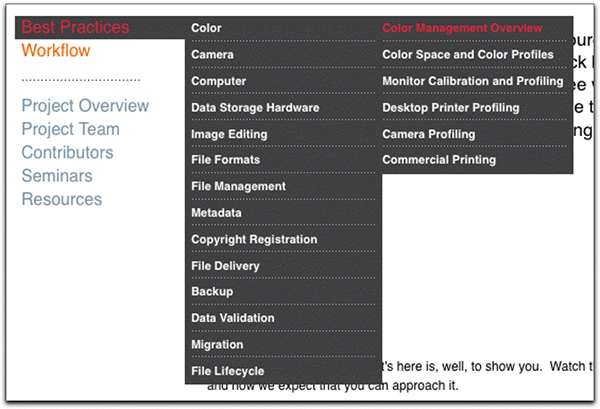 Figure 3 The Workflow pages, available on the menu at left, provide step-by-step movies of best practices in workflow form. In the Best Practices section, we explain the elements of the capture, editing and management, and how they relate to each other. How does capture format relate to image editing tools? What is data validation, and how it is impacted by choices you make for storage hardware? What can be described by metadata, and how can it help you? You'll find all the answers in the Best Practices sections. This section is divided by subject matter, such as color, camera, metadata, storage hardware, etc. . Each section begins with an overview of the topics that are included. We suggest the overview is a great place to start, even if you're very familiar with the topic. There are a lot of links you'll find to direct you to related concepts. Many of these pages have movies embedded in the page. These are meant to be viewed in the order they appear. We've added these wherever we think it's easier to show you a concept than to simply explain it. Figure 4 The Best Practices sections are your place to learn about all the technology that makes digital photography work. Most of the pages on this site have the following elements as part of the page. Here's a rundown. Immediately below the header, you'll see a breadcrumb trail that shows you what section you're in. This corresponds to the flyout menus on the left. Below that is the page title, which also corresponds to the flyout menus. The Intro copy provides a short description of the material on the page. The on-page links list the subject headers for the page, and can jump down to a particular section. Figure 5 Navigational links at the top of each page let you know where you are, and what's included on the page. At the bottom of each page, you'll see a set of page links for the section you're in. The Up link takes you to the "Table of Contents" page for this section. The "Back to" link goes to the previous page. Also note that movies, screenshots and photos are all labeled as "Figures." You can see in Figure 6 below that movies have the play arrow at the bottom left of the window.. Figure 6 The links on the bottom of a page help you navigate through the pages in that section. We have several different kinds of links on the page. Each has a particular format. These links take you to a page within the same section you're in, such as the Color section. These links take you to a different section of the site. We write the link out this way so that you'll know that the link will be jumping you to another part of the site.